The Caesar Chicken Salad with romaine lettuce, chunks of chicken breast, grape tomatoes, shredded Parmesan cheese, Caesar dressing and garlic croutons for a total of 500 calories, 34 grams of fat and 20 grams of carbohydrates. The Southwest Taco Salad has Wendy's Chili, shredded cheddar cheese, and diced tomatoes over mixed greens, served with Ancho Chipotle Ranch dressing and tortilla strips and sour cream. It has 700 calories, 41 grams of fat, and 51 grams of carbs. The Spinach Chicken Salad has romaine lettuce and baby spinach topped with chicken, chopped egg and grape tomatoes. It comes with sweet and sour bacon dressing and garlic croutons served on the side. It is the low(er) fat offering with 450 calories, 16 grams of fat and 42 grams of carbs. For the sake of comparison, Wendy's single hamburger and medium fries (combo #1) has 870 calories, 41 grams of fat (same as the Chicken Caesar Salad), and 95 grams of carbs. 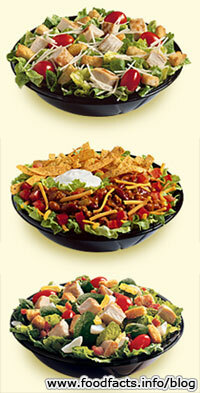 All three salads retail for $4.19. Is Wendy’s following McDonald’s track and offering the nutrition information of its menu to customers? This looks like a cynical way of letting people think they are making an effort to eat better.